As I began in early May to anticipate InfoComm and a new crop of 1080P projectors that waits in the wings to shake up the projector world, Norway was not the kind of place that sprang immediately to mind. The town of Fredrikstad, an idyllic spot that sits near the border of Norway and Sweden, would be, I thought, a welcome respite from the frenetic atmosphere surrounding the industry. 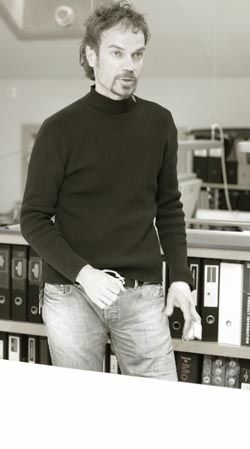 B�rd Eker, independent industrial designer, and majority owner of projectiondesign. When I met Brd Eker, I understood why Fredrikstad deserves its place on the projection map. I've been to visit a few projector manufacturers in my day, but never have I have visited one with the unique genetic makeup of projectiondesign. In a nutshell: it's a projector company, started by a Norwegian industrial designer, who brought some of Europe's best projection engineers and marketers on board to launch products into one of the most competitive markets anywhere. Brd Eker is an anomaly in this industry. He's the majority owner of one of the most advanced DLP projection manufacturers in the world; he's also the industrial designer of the world's fastest production sports car (the KOENIGSEGG CCR); he is the industrial designer and pilot and owner of the fastest boat in the Class One powerboat world championship (The Spirit of Norway). I could go on. But you get the drift. Don't think so much "design." Think speed. Speed to market. Performance. And just plain speed. Eker doesn't talk that much about "form following function." He's too busy creating products that are all about performing, and that's why projectiondesign has been able to carve out a remarkably robust niche in high-resolution, high-performance DLP projection. And they have done so manufacturing in a Scandinavian country where costs are not cheap. J�rn Eriksen, president & CEO of projectiondesign, showed Rental & Staging Systems their new 3-chip DLP projector in prototype form at their factory in Norway in May. projectiondesign will be demonstrating the completed unit at InfoComm. Most of you will never go to Norway to check this all out for yourself. Industry veteran Gary Plavin, anchoring down projectiondesign in the U.S, may be your only face of projectiondesign, and you won't meet Eker, or Jrn Eriksen (president & CEO) or Sture (pronounced "studer") Berg (who deserve a story of their own...they bring decades of experience in the projector wars to the table). But you don't have to venture to Norway to realize that this nimble shop in Fredrikstad has been bringing to market some of the most interesting new DLP projectors in recent years. In Fredrikstad, I saw a demo in May that is the most impressive development I've seen in DLP this year: the new projectiondesign F1, to be called the M25 when it's launched at InfoComm, a new generation 1080P one-chip that is a step beyond anything I've seen. This new unit uses a 7-segment color wheel (R-G-B-R-G-B-neutral density) combined with a unique and pd-patented version of TI's "Brilliant Color" to achieve an imaging speed that eliminates any vestiges of color breakup or artifacting you saw in any previous DLP one-chip system. Speed, indeed. I guess that's what you learn by producing the world's fastest sports car. Second-generation1080P single-chip DLP, with more color wheel options and new software drivers, is evolving at a rapid pace in the hands of cutting-edge manufacturers like pd.